Thrillpowered Thursday: Thrillpowered Thursday - 2. Well, this wasn't the most well-planned exercise I've ever embarked upon. Seven days and seven issues after my first entry and I pick up prog 868, the first issue of 1994, and it's what we call in the business world a "challenge." Part of the plan here is to persuade some of you skeptical Earthlets to try the Galaxy's Greatest, and here we hit a prog containing one of the worst Judge Dredd stories ever ("Frankenstein Division," written by Mark Millar), one of the worst Future Shocks ever (in which Santa Claus is hounded by a murderous unemployment agent, also written by Mark Millar) and an episode of one of the worst series to ever appear in any comic, ever (Mother Earth, surprisingly not written by Mark Millar but by Bernie Jaye). 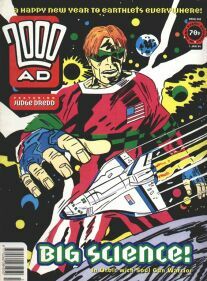 Normally I boast that a bad 2000 AD story is nevertheless superior to even a very good story from most publishers. When Mark Millar is involved, that simply isn't true. To make matters worse for many readers, this prog also contains an episode of Soul Gun Warrior, which perhaps seven people on the planet enjoyed. Fortunately for you readers today, I'm one of them. In Soul Gun Warrior, the stratosphere is haunted by the ghost of Russian cosmonaut Yuri Gagarin, who takes out his rage by wrecking whatever American spacecrafts come his way. Fortunately, NASA has an ally in Dr. Bob Oppenheimer, whose secret experiments in the Nevada desert have led to the creation of the Soul Gun, the only chance at sending a volunteer into the astral plane to stop Gagarin's ghost. That's got to be the greatest concept for a comic, ever. The Soul Gun stories - there were two, including a sequel called Soul Gun Assassin - were helmed by Shaky Kane, although informed sources suggest that the dialogue was scripted by an uncredited Alan McKenzie. 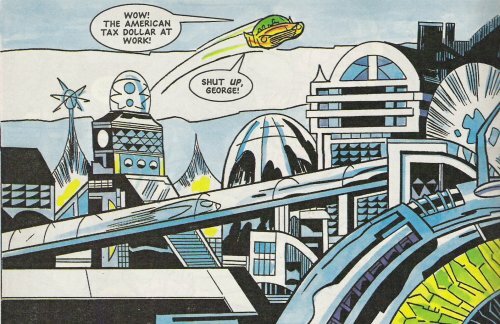 As the examples here show, Kane is very much inspired by Jack Kirby. To be fair, Kane certainly inherited Kirby's eye, but he didn't inherit his linework. He gets the posing perfectly, but his brush is too heavy, and the colors are often garish. Kirby was a master of the details, especially things like hands and suit jackets. Kane gets pretty carried away with his fantastic ideas and technology and lets these details slip. I can't help but wish there had been a little more attention paid to the details, because Kane has provided better work in other places. 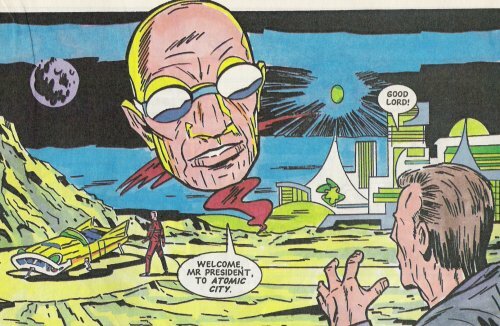 (Best of all has been the cover art to an issue of Grant Morrison's Doom Patrol which paid homage to Kirby.) Nevertheless, the scope itself is grandiose and wonderful, and there's a feel throughout of a high-concept balancing act. Six or so years later, Andy Diggle took over as editor and espoused his "shot glass of rocket fuel" approach to the weekly episodes. I don't know that he'd agree that Kane met it - he's been conspicuously absent from 2000 AD for a good decade - but that's certainly what he was attempting, years previously. It also features one of my favorite cliffhangers, when the Soul Gun volunteer takes his place under the giant, Kirby-inspired supertechnological - phantasmagorical machine, and a small, innocuous .38 revolver pops out to send the volunteer to the astral plane via a bullet in the head. That's great! The Soul Gun stories have never been reprinted and are therefore sadly not available in a collected edition. Regardless of how much I like them, they remain pretty unpopular with the 2000 AD fan base, and a new edition probably wouldn't be a particularly profitable enterprise! Next week, I'll talk about something other than a quick rundown of a story you've not heard of before. We'll look into the issue of stereotyping, and when it gets aggravating for readers. Back in seven!